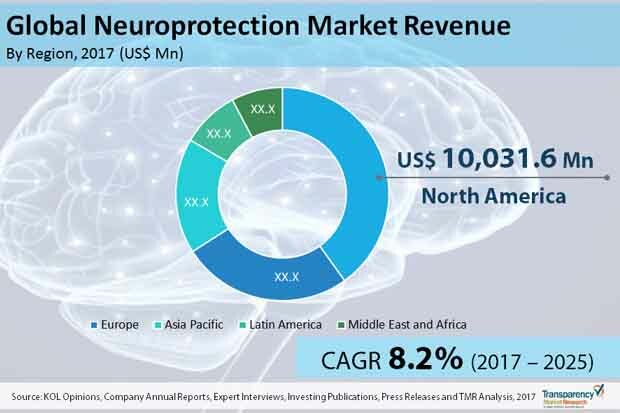 The global neuroprotection market was valued at approximately US$ 47,000.0 Mn in 2016 is projected to register a growth rate of 8.2% from 2017 to 2025, according to a new report published by Transparency Market Research (TMR) titled “Neuroprotection Market – Global Industry Analysis, Size, Share, Growth, Trends, and Forecast, 2017–2025”. The report suggests that increasing incidence and prevalence rates of neurological disorders such as Alzheimer’s, Parkinson’s, Macular Sclerosis ,and other neurological conditions causing neural damage is expected to assist the growth of neuroprotection market in the coming years (2017 to 2025). As major drug manufacturers are growing their product portfolios by increasing product development in developed markets such a North America and Europe region along with increasing strategic collaboration with regional players in developing economies. The North America, Europe, and Asia Pacific regions are likely to account for major share in the global neurprotection market. Increasing drug trials, growing awareness for neurological disorders, and increasing healthcare infrastructure in emerging markets such as India is likely to drive the growth of neuroprotection market in Asia Pacific, the market is anticipated to exhibit a CAGR of 9.9% from 2017 to 2025. Neuroprotection is the property of drugs which are used in prevention of neuronal degradation by deterring one or more than one pathophysiological phases in the progressions which follow brain ischemia due to occlusion of a cerebral artery or neurodegenerative processes. These neuroprotective agents play an important role in the management of neurodegenerative diseases as well as in central nervous system trauma, cerebral ischemia, and other conditions. Rapid increase in pharmaceutical sector and increasing patient population has led to an increased demand for neuroprotective drugs as they prove to be highly efficient in treatment of neurodegenerative diseases such as Alzheimer’s, Parkinson’s, Macular Sclerosis ,and other diseases where neural damage takes place. These drivers along with increasing incidences of traumatic brain injury are expected to drive the Neuroprotection market during the forecast period. For instance, TBI is a contributing factor to a third (30%) of all injury-related deaths in the U.S. The global Neuroprotection market has been segmented into product, application, and region. On the basis of product the Neuroprotection market has been further segmented as; Free Radical Trapping Agents (Antioxidants), Glutamate Antagonists (Anti-Excitotoxic Agents), Apoptosis Inhibitors, Anti-inflammatory Agents, Neurotrophic Factors (NTFs), Metal Ion Chelators, Stimulants, and Others. During the forecast period 2017-2025 the free radical trapping agents (antioxidants) is expected to expand at a higher rate of CAGR to reach a market value of approximately US$ 18,000.0 Mn by 2025.The free radical trapping agent product held major share in Neuroprotection market in 2016, the segment is expected to continue its strong hold in neuroprotection market during the forecast period. Increasing drug discovery and product launch is anticipated to drive the Neuroprotection market growth during the forecast period. The global Neuroprotection market on the basis of application has been segmented to prevention and treatment. The treatment segment held major market share in Neuroprotection market in 2016, the segment is expected to exhibit a healthy CAGR during the forecast period. The treatment application provides a lucrative opportunity to manufacturers because of increasing diagnosis rate of neurodegenerative diseases in developed economies along with higher awareness. For instance, In the U.S. multiple sclerosis (MS) affects approximately 400,000 individuals, and worldwide, the disease affects 2.5 million individuals, varying different geographical regions. Well-established pharmaceutical and biotechnology industry, increasing research activity, increasing in cadence and prevalence of neurological disorders and growing demand for highly efficient drug for target specific treatment of disorders is expected to increase demand for Neuroprotection has credited for the supremacy in the region. For instance, In December 2016, FDA approved Biogen, Inc. drug SPINRAZA (nusinersen) to be used to treat pediatric and adult patients suffering from spinal muscular atrophy (SMA). North America accounted for the principal share in the global Neuroprotection market in 2016 in terms of value, followed by Europe and Asia Pacific. North America Neuroprotection market is expected to expand at a healthy rate of CAGR during the forecast period from 2017 to 2025. Europe accounted for the second largest market of the Neuroprotection. The Asia Pacific Neuroprotection market is expected to witness a high growth rate during the forecast period. Presence of well-established pharmaceutical and biotechnology industry, increasing research activity, increasing in cadence and prevalence of neurological disorders and growing demand for highly efficient drug for target specific treatment of disorders is expected to increase demand for Neuroprotection drugs in the region. The report also provide profiles of leading players operating in global neuroprotection market include Daiichi Sankyo Company, Eli Lilly and Company, Allergan plc, Dr. Reddy’s Laboratories Ltd., Teva Pharmaceutical Industries Ltd., Novartis AG, AstraZeneca plc, Astrocyte Pharmaceuticals, Inc., F. Hoffmann-La Roche AG, Biogen Inc., and other prominent players. Increasing research, and products launches along with along with increasing geographical footprint are major strategies adopted by companies in neuroprotection market. For instance, In March 2017, Dr. Reddy's Laboratories Limited entered into a distribution agreement Integra Life Sciences Holdings Corporation, to market and distribute Integra’s neurological products in India.